The region’s infrastructure has taken a heavy toll on low-income communities and communities of color. Highways, industrial facilities, and other sources of pollution are disproportionately located in these communities, causing serious health impacts and damaging neighborhood economies. Infrastructure agencies as well as states and municipalities need to prioritize the health of these communities by removing sources of pollution wherever possible and providing new sources of revenue for neighborhood investment. Many residential communities in the tri-state region are located near sources of pollution, including current and former industrial sites, highways, seaports, and airports. Residents can be exposed to noxious emissions from fumes, contaminated soil, or water, and in some instances, disruptive levels of light and noise that can cause stress. The communities with the most exposure to these negative environmental conditions are disproportionately low-income communities of color, resulting from a history of government housing and infrastructure policies that paid little regard to the health and environmental impacts on these communities. 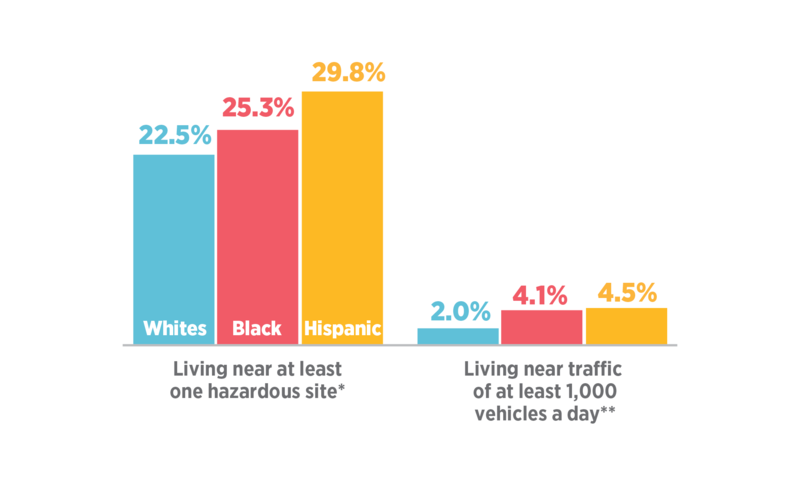 Hispanics in the region are 30 percent more likely to live near hazardous sites, and blacks and Hispanics are twice as likely to live near heavy traffic. These are communities that often already face many health challenges, such as limited access to health care, lack of access to healthy food, and unhealthy housing conditions because of poverty and other socioeconomic stressors. East Harlem and Hunts Point residents, who are predominantly black and Hispanic, are three to four times more likely to die from exposure to air pollution than residents of other New York City neighborhoods. Asthma rates in Newark are 80 percent higher than those in neighboring Jersey City. Air quality is important to me because what you’re breathing in now affects you later. Addressing this public health crisis is particularly urgent as climate change is likely to intensify the impacts of these sources of pollution. As heat waves worsen the impact of air pollution, and as sea-level rise and storms cause flooding in low-lying industrial areas, releasing contaminants into the water, we must remedy the environmental injustices of the past, and give everyone the chance to live in healthy communities in the future. Ports and airports, and the truck traffic they generate, are terrible sources of air, light, and noise pollution for the people who live near them—particularly the residents of Newark and Elizabeth, who have both facilities in their backyard; Bayonne and Jersey City residents near the New Jersey ports; and Queens residents near LaGuardia and Kennedy airports. At the region’s seaports, the Port Authority should set a target of zero emissions from cargo-handling equipment by 2030, and zero emissions from trucks by 2035, as the Port of Long Beach, CA—the only U.S. port bigger than New York’s—recently adopted. In addition, ships at berth should plug into the electric grid instead of burning highly polluting bunker fuel (so-called “cold ironing”). Light- and noise-abatement programs should also be expanded to buffer nearby communities from their impacts. At the airports, the worst local air pollution emitters are not airplanes, but ground vehicles. The best strategies for improving air quality are better access to the airports, and requiring all on-airport vehicles (baggage haulers, aircraft tugs, etc.) to be electrically powered. Aircraft could also be required to be plugged into the electric grid when stationary. The tri-state area’s last highly polluting coal-fired power plants are scheduled to close in the next few years. But combined gas/coal power plants remain. As more renewable energy comes online in the next decade and fossil-fuel plants are retired, the dirtiest facilities should be retired first. New infrastructure, particularly polluting facilities, should not be sited in communities that are already overburdened by pollution and poor health outcomes. Many urban highways blight and divide neighborhoods, exposing them to dangerous levels of air pollution. High volumes of traffic also cause noise and dangerous pedestrian conditions. State departments of transportation should prioritize improving the highway segments that cause the most harm to neighborhood health, prosperity, and cohesion, and work with communities and municipalities to remove or transform them into community assets. From South Bronx to Newark and beyond, neighborhoods that have been damaged by these policies should receive preference for funding neighborhood improvements. This is especially true for new sources intended to address environmental challenges. One potential source would be revenue from an expanded cap-and-trade market, a portion of which could support energy rebates and community investment. Some of the this support should be directed to non-governmental organizations that have been vital to successful clean-up and revitalization efforts in environmental-justice neighborhoods. These proposals would result in reduced vehicle pollution near vulnerable communities, especially around ports and certain highway areas. Eventually, coupled with greater investments in these communities, health outcomes should improve. The governance mechanisms proposed would help prevent new environmental health disparities from emerging as a result of climate change. The Fourth Regional Plan proposes several new revenue sources, such as expanded carbon pricing and vehicle miles tolling. A portion of these revenues should go to communities most overburdened by our energy and transportation infrastructure, for planning and capital investment purposes. The costs of highway decking could partially be covered by redevelopment and increased property tax revenues. Depending on the specific impact, developers and other private companies should carry some of the costs.